Our designs often incorporate surface relief, texture and patterning achieved through concrete formwork. Previously this was done through placement of hand carved or natural stone elements. As technology advances, more and more of this carving is done through 3D milling, where a computer uses a code to direct router bit to cut out a shape. The shapes that the machine cuts are modeled digitally. Realizing interesting, graceful and compelling patterns and forms requires knowing how to use powerful digital design modeling software. We are currently enrolled in a program at the University of Washington focusing on Digital Design and Fabrication for design professionals. 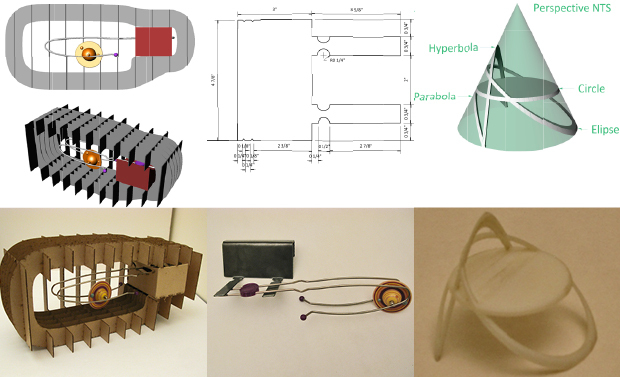 Fall Quarter focused on learning the modeling software Rhino and how to use it to create objects with five fabrication tools. 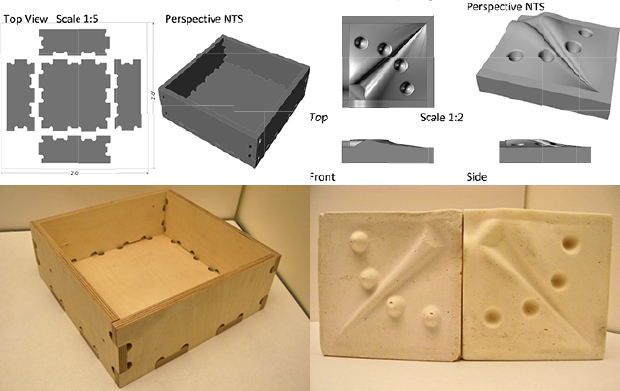 The first project used the laser cutter to make an egg crate structure. The second used the CNC plasma cutter to cut a steel shelf. The third used the 3D printer to make a small object. The fourth used the large CNC router to cut plywood and make joints. The fifth used the small CNC router to cut foam to make a relief mold for plaster. Understanding the steps involved in creating our vision in a digital model then translating that model into a code that the computer can use to run the cutting tool allows use better control over the design process. We can use our knowledge to design things better and to know what to expect from the final cut product. Making the transition into a digital process will give us the opportunity to explore and create new and exciting forms, textures and patterns.